Cook fluffy, thick waffles for your hungry customers with the Carnival King WBM26 double belgian waffle maker! This double waffle maker features 2 independently-operated sides with 180 degree rotating aluminum grids with non-stick coating. Both grids are 7 1/2" in diameter, allowing for large, unique waffle creations. 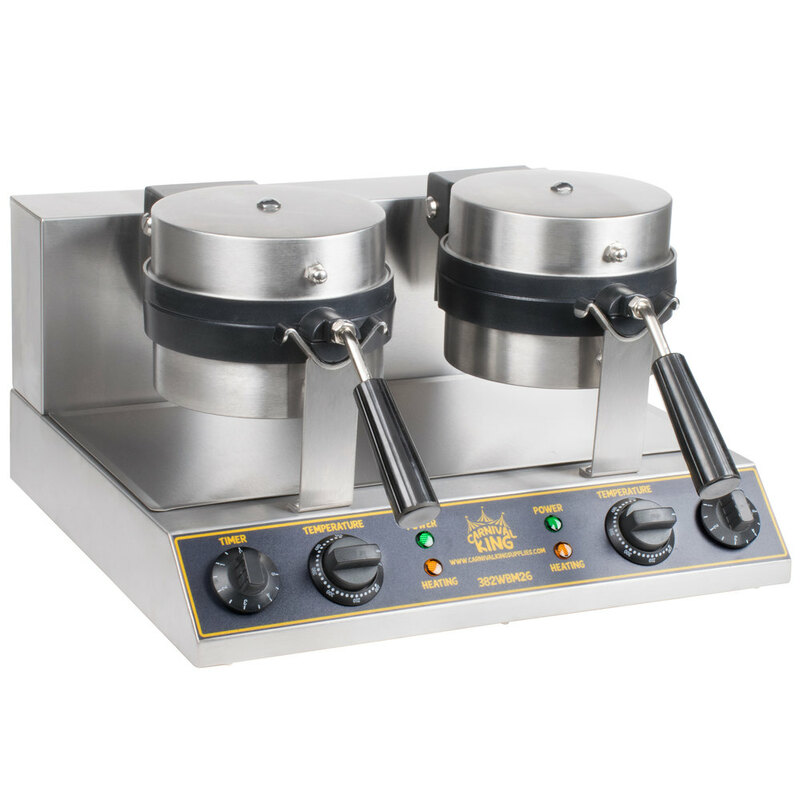 Each side boasts 2200W of heating power to ensure even and consistent heating, allowing you to keep up with your busiest hours by making up to (40) 1 1/4" thick waffles per hour. The dual-sided design makes the most of limited counter space by providing twice the output of a single grid unit with the same compact size. Plus, the ergonomic, cool-touch handle is an added safety feature to prevent burns. This waffle maker also comes with a convenient 5 minute audible timer so you can set the time, close the baker, and carry on with other tasks around your busy kitchen. The temperature is adjustable up to 570 degrees Fahrenheit with an orange light to indicate when the unit is heating up, while a convenient green light always lets you know when this waffle maker is powered on. Thanks to its heavy base and non-skid feet, you can be sure this unit will stay in place when in use. The removable drip tray also makes cleanup a breeze so you can continue whipping up your signature waffles. For best baking results, set the temperature to 400 degrees Fahrenheit and the timer to 2.5 minutes for even, golden brown waffles! Left to Right: 19 3/4"
Front to Back: 17 1/4"